Dive into a wonderful, limitless world of made-up stories! 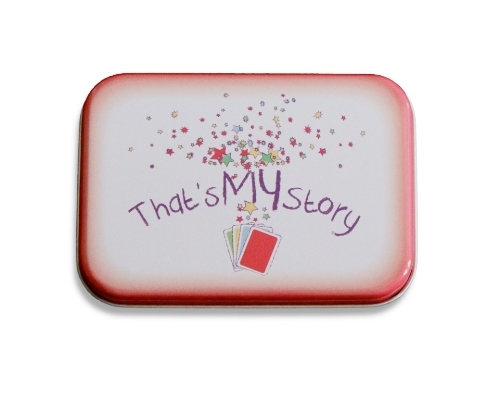 Fun story telling card game in a neat little metal box. A great alternative to hauling children bedtime books while travelling. Ideal for pre-prep to early primary school. 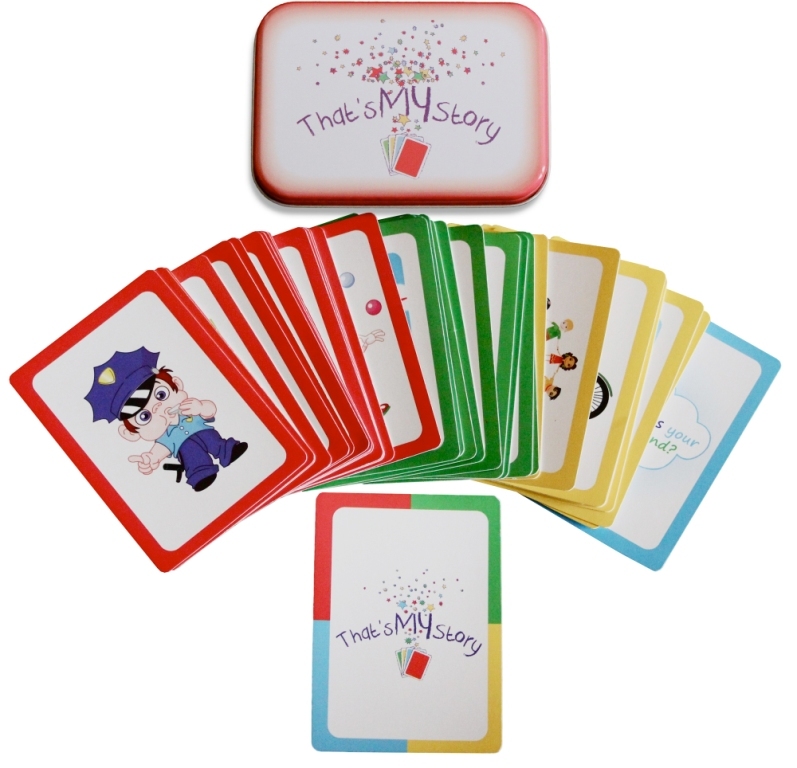 This simple, bright and fun card set develops children's early literacy by allowing them to explore and expand language skills. Ideal for before they start school and beyond. A nice way to ignite your own creativity! Younger children (3-4) may initially prefer a parent to model storytelling, but allow them to embrace their creativity by choosing the cards they like. 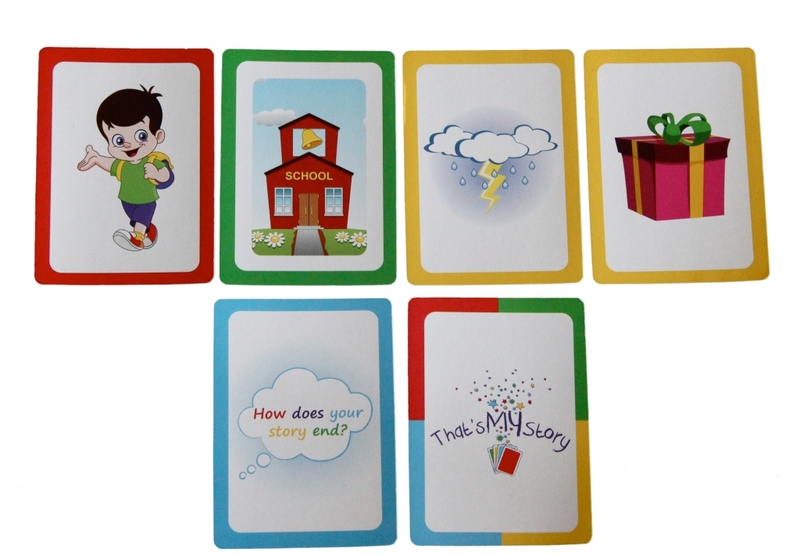 You can then encourage them to create simple stories, using only one or two cards. Older children (5+) can use a more structured storytelling process (see below). Players take turns to co-create the story. As each player adds their own part of the story, they first have to retell what’s been said by the other players. Pull a random card from the pack and ask another player to create a story just from that one card! Choose 5 cards at a time. Show the player the one image and ask them what they see. Turn the card over and read them the word, asking them to repeat the word and spell the letters. Continue for the other cards. Then, place all cards face down and ask the player to find one of the words. For this game, you’ll need two packs. Choose 10 cards from one pack and place down with images facing up. Choose the same 10 cards from the other pack and place in a pile. The player has to place the matching picture on the correct card.